The Celebrity Baby Bump: Tina Fey Announces She Is Pregnant! 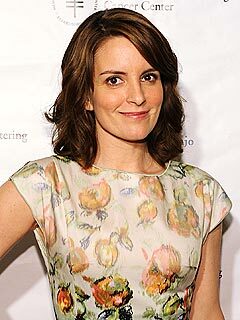 Actress Tina Fey made her new baby announcement Wednesday while appearing on the Oprah Winfrey Show. Fey told audience members that she and husband, composer Jeff Richmond, are expecting baby number two. The couple are parents to 51/2 year old daughter, Alice. The Saturday Night alum was on Oprah to promote her new book, Bossypants, and an upcoming Saturday Night Live reunion, when she announced she is 5 months pregnant with the couple's second baby. "I went for my annual checkup and, tired of carrying this anxiety around, burst into tears the moment she said hello," the Emmy winner, 40, writes in her new memoir Bossypants. "I laid it all out for her, and the main thing I took away from our conversation was the kind of simple observation that only an impartial third party can provide: 'Either way, everything will be fine.' "
She says she also felt "stricken with guilt and panic" when her 5-year-old daughter Alice – probably "the only child in her class without a sibling" – would say, "I wish I had a baby sister," and the Fey recalls how she would "debate the second-baby issue when I can't sleep." Ultimately Fey says, she realized work just was not as important to her as having another baby. "Science shows that fertility and movie offers drop off steeply for women after 40," she says in her book. "What's so great about work anyway? Work won't visit you when you're old. Work won't drive you to get a mammogram and take you out after for soup."